SAUDI ARABIA – Two desalination plants with a combined cost of $1.06 billion will be constructed in the cities of Al-Khobar and Jubail in the Eastern Province of Saudi Arabia. The Minister of Environment, Water and Agriculture Abdurahman Al-Fadli recently revealed that the desalination units will contribute an additional million cubic meters of water daily to multiple cities in the Eastern Province. The plants are expected to become operational by the middle of 2021. PAKISTAN – Hub Power Company (Hubco) has offered to build a desalination plant for the Sindh government to help resolve the water crisis in Karachi. The Hub plant would have a capacity of 1.14 million m3/day and could be expanded to 4.54 million m3/day. Hubco officials have informed the government that Karachi’s non-recycled waste could be utilized to generate electricity to run desalination plants. The city’s garbage could potentially generate 200 megawatts of electricity to produce 719,228 m3 water per day. UAE – Samsung Engineering Co. is set to build a power plant and a desalination facility in the United Arab Emirates. The company received an order worth $472.99 million from the Abu Dhabi Oil Refining Company to deliver the facilities by June 2023. The desalination unit will produce 62,400 m3/day and the power plant will generate 230 megawatts of energy. As part of a lump-sum turnkey contract, Samsung will complete the engineering, procurement, and construction of the facilities. AUSTRALIA – Tugun’s desalination plant could become permanently operational in the summer of 2020. 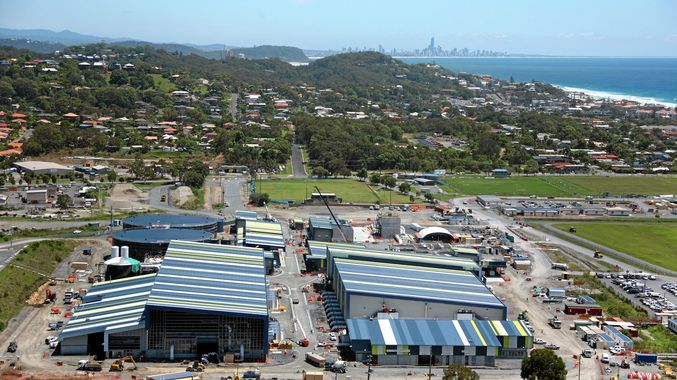 Due to repairs of the Gold Coast’s Mudgeeraba’s treatment plant—which normally provides Gold Coast’s drinking water—170,000 people in the region are currently receiving water from Tugun’s Desalination plant. Officials may decide to permanently operate Tugun’s desalination plant during the summer months because of estimates of population growth and increased demand. The plant has a capacity of 125,000 m3/day and was taken offline after its construction in 2010 because of high costs. “Saudi Arabia to build $1bn desalination plants”, utilities-me.com, Sep 11, 2018. < https://www.utilities-me.com/power/11742-saudi-arabia-to-build-1bn-desalination-plants > accessed Sep 13, 2018. “Hubco offers its plant for desalination”, dailytimes.com.pk, Sep 4, 2018. <https://dailytimes.com.pk/292426/hubco-offers-its-plant-for-desalination/> accessed Sep 13, 2018. Baset Asaba “Samsung Engineering to build power and desalination plants worth $472.99mn in UAE”, arabianindustry.com, Sep 9, 2018. <https://www.arabianindustry.com/utilities/news/2018/sep/9/samsung-engineering-to-build-power-and-desalination-plants-worth-47299mn-in-uae-5971862/> accessed Sep 13, 2018. Tony Moore “Tugun desal plant back online permanently from summer 2020: Seqwater”, brisbanetimes.com.au, Sep 1, 2018. <https://www.brisbanetimes.com.au/national/queensland/tugun-desal-plant-back-online-permanently-from-2020-seqwater-20150901-gjcioa.html> accessed Sep 13, 2018.